Dawn Publications, 2014. ages 4-10. 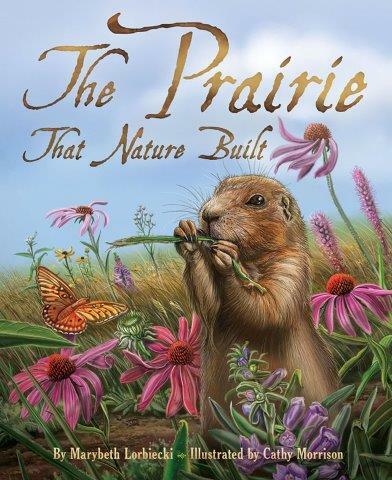 “This is the prairie that nature built.” Continuing in a house-that-jack-built mode, this book highlights the critters that worm and squirm under the prairie, the diggers that burrow, the plants and insects, birds and beasts. All of them, it turns out, play an essential role in maintaining the prairie. I like the detailed illustrations, and the way Cathy Morrison uses the page. Sometimes you need to turn the book to get the full length of it all, from root to sky. I also like how, in the end, author Marybeth Lorbiecki brings the prairie home to us, as a place where a child and her dog could roam and explore. Head over to Sally’s Bookshelf for some hands-on activities related to the book.